Canto is a shapely cage with basic equipment for parakeets. The cage can be separated into two sections using the included extra cage wall. This makes it especially well-suited for acclimating new animals to their surroundings and neighbours. It can also be used, for example, to give ill animals a quiet place to recover without completely separating them from the other bird(s)Both sides as well as the front of Canto can be opened. Two separate doors allow you to open one side of the cage at a time. The cage drawers on each side can also be cleaned independently. 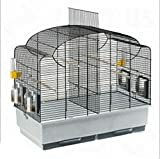 This entry was posted in Birds and tagged Accessories, Areas, Basic, Beautifully, Bird, Black, Cage, Grid, Into, Parakeets, Partitioned, Shaped by One Boutique. Bookmark the permalink.